Most Ven. Sariputta Maha Thera. 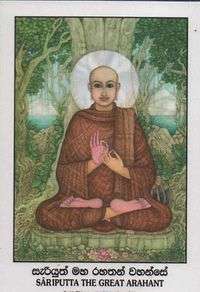 The Right hand side chief disciple (Dakkhinasāvaka) of Gautama Buddha. Most Ven. Maha Maudgalyayana Maha Thera. The left hand side chief disciple (Vāmasāvaka) of Gautama Buddha. Theravada Buddhism defines arhat (Sanskrit) or arahant (Pali) as "one who is worthy" or as a "perfected person" having attained nirvana. Other Buddhist traditions have used the term for people far advanced along the path of Enlightenment, but who may not have reached full Buddhahood. Mahayana Buddhist teachings urge followers to take up the path of a bodhisattva, and to not fall back to the level of arhats and śrāvakas. The arhats, or at least the senior arhats, came to be widely regarded as "moving beyond the state of personal freedom to join the Bodhisattva enterprise in their own way". The Sanskrit word arhat (Pāḷi arahant) is a present participle coming from the verbal root √arh 'to deserve', cf arha 'meriting, deserving'; arhaṇa 'having a claim, being entitled'; arhita (past participle) 'honoured, worshipped'. The word is used in the Ṛgveda with this sense of 'deserving'. A common folk etymology derives the word from ari (enemy) and hanta from the root √han (cf: Hunter) 'to strike, to kill'; hence the translation 'foe-destroyer'. Professor Richard Gombrich has argued that the present participle is "jarring" and seems out of place when there is an adjective from the same root (arha). Since Jains used two Prakrit forms of the word arahanta and arihanta, the folk etymology may well be the correct etymology. Gombrich argues that this stems from the same metaphor as the Jain title jina "conqueror", whence jaina "related to the conqueror", i.e. Jainism. The term arhat is often translated into English as arahat. The term arhat was translated into some East Asian languages phonetically as a transliterated term, exemplified in the Chinese āluóhàn (Ch. 阿羅漢), often shortened to simply luóhàn (Ch. 羅漢). This may appear in English as luohan or lohan. In Japanese the pronunciation of the same Chinese characters (Ja. 阿羅漢) is rakan or arakan. The Tibetan term for arhat was translated by meaning from Sanskrit. This translation, dgra bcom pa, means "one who has destroyed the foes of afflictions." Thus the Tibetan translators also understood the meaning of arhat to be ari-hanta. In Theravada Buddhism the Buddha himself is first identified as an arahant, as are his enlightened followers, because they are free from all defilements, without greed, hatred, delusion, ignorance and craving. Lacking "assets" which will lead to future birth, the arahant knows and sees the real here and now. This virtue shows stainless purity, true worth, and the accomplishment of the end, nibbana. ↑ Routledge Encyclopedia of Buddhism: "When the great Theravada commentator, Buddhaghosa, wrote the Visuddhimagga delineating the nature of the gradual path to enlightenment, he placed the arahant at the completion of that path. The arahant stands as a transcendent figure in Theravada, one who has followed to its end the way of Dharma set out by the Buddha." 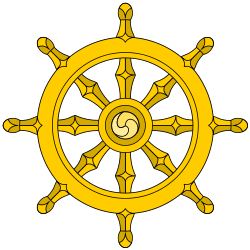 ↑ Bhikkhu Bodhi: "The Buddha is the first of the arahants, while those who reach the goal by following his path also become arahants. In the verse of homage to the Buddha, it is said: "Iti pi so Bhagavā Arahaṃ... — The Blessed One is an arahant..." Shortly after his enlightenment, while walking to Benares to meet the five monks, a wanderer stopped the Buddha and asked who he was. The Buddha replied: "I am the arahant in the world, I am the supreme teacher" (MN 26/I 171). So the Buddha first of all declares himself to be an arahant." ↑ "From the perspective of the Nikāyas, the ultimate goal – the goal in strict doctrinal terms – is nirvāṇa, and the goal in human terms is arahantship, the state of a person who has attained nirvāṇa in this present life." ↑ Bodhi (2005), p. 268, translates this fourth way as: "a monk's mind is seized by agitation about the teaching." Thanissaro (1998) gives a seemingly contrary interpretation of: "a monk's mind has its restlessness concerning the Dhamma [Comm: the corruptions of insight] well under control." Thus, it appears possible to interpret the excitation (Pali: uddhacca, see Rhys Davids & Stede, 1921–25) as either something that the future arahant uses to impel their pursuit of the path or something that the future arahant controls in order to pursue the path. ↑ Keown and Prebish (2007), Routledge Encyclopedia of Buddhism, p. 36: "When the great Theravada commentator, Buddhaghosa, wrote the Visuddhimagga delineating the nature of the gradual path to enlightenment, he placed the arahant at the completion of that path. The arahant stands as a transcendent figure in Theravada, one who has followed to its end the way of Dharma set out by the Buddha." 1 2 Warder 2000, p. 67. 1 2 Rhie & Thurman 1991, p. 102. 1 2 Rhie & Thurman 1991, p. 102-119. ↑ Cozort, Daniel. Unique Tenets of the Middle Way Consequence School. Snow Lion Publications. 1998. p. 259. ↑ prebish & Keown 2004, p. 88. ↑ Bhikkhu Bodhi. "Transcendental Dependent Arising". Access to Insight. Archived from the original on 30 March 2009. Retrieved 16 March 2009. ↑ Ānanda's teaching on achieving arhantship can be found in AN 4.170. Translations for this sutta can be found in Bodhi (2005) pp. 268–9, 439, and Thanissaro (1998). ↑ Sheng Yen. Orthodox Chinese Buddhism. North Atlantic Books. 2007. p. 149. ↑ Sheng Yen. Orthodox Chinese Buddhism. North Atlantic Books. 2007. p. 163. ↑ Powers, John. A Concise Introduction to Tibetan Buddhism. Snow Lion Publications. 2008. p. 36. ↑ Susan Bush and Ilsio-yen Shih (1985). Early Chinese Texts on Painting. Cambridge, MA, and London. p. 314. Bush, Susan, and Hsio-yen Shih. Early Chinese Texts on Painting. Cambridge, Mass: Published for the Harvard-Yenching Institute by Harvard University Press. 1985. Laufer, Berthold. "Inspirational Dreams in Eastern Asia". The Journal of American Folklore 44,no. 172 (1931): 208–216. Wikimedia Commons has media related to Arahant.